She totally would be! I love so many HP characters, but Hermione is my #1 pick here, LOL! I could definitely pick up good studying habits from Hermione. I am horrible at studying; my philosophy is looking over my notes a couple of times and then giving up. Thankfully, I am great at taking tests. Hermione was able to ensure that Ron and Harry always passed, so I'm sure I could learn from her. 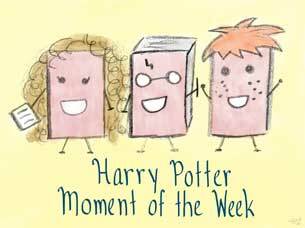 I love how Hermione helped Harry and Ron out, even though they sometimes exasperated her with their study habits- or lack thereof, LOL! Ditto^^ Being expelled from Hogwarts would be THE nightmare to have - if we ever get in dammit! I definitely think I would have benefited from having another bookworm friend in school, so Hermione was an automatic choice here! YES. WHERE ARE OUR LETTERS???? I would've loved to have had a friend like Hermione when I was in school- someone who was also enthusiastic about studying, LOL! I feel like I'd end up alternating study partners: Hermione would be great, but I don't think I could be quite as driven as her all of the time. I'd have to have the occasional study session where we could get a bit distracted or chat a bit too! Plus, Hermione gets pretty stressed about exams, and so do I, so I feel like we could work each other up to more and more anxious states and get less productive.